There is so much more to singleness than we know. If you are currently single at the moment do no waste your singleness. God is not finished with you yet. My goal for listing these quotes is to help you to embrace singleness and grow in your relationship with the Lord. Save yourself for the one God has for you. The one who God has for you is worth the wait. Don’t allow temporary happiness to cause you to miss out on what God has for you. One day you’re going to look back and be so thankful that you waited for the right one. God is at work in your life right now. Not only is God working in your life in ways that you may not understand, but He is also working in you. He is changing things about you, He is preparing you, He is revamping your prayer life, He is helping you to experience Him in ways you have never done before, and more. Singleness is a blessing because I believe you have more time to experience God and get to know Him than those in relationships. Don’t look at singleness in the world’s eyes. The world does not define who you are. Don’t look at your situation through the lens of the world, but instead look at your situation through the lens of God. Your identity does not come from the world! The world makes singles feel unattractive, unwanted, embarrassed, weak, etc. All this does is create brokenness in the person’s life and it makes them pursue any relationship just to ease the pain. It takes a strong and confident person to wait for what God has in store for them. 16. “Singleness ought not be viewed as a problem, nor marriage as a right. God grants either as a gift. Don’t rush into a relationship just to be with someone. If you’re not careful in singleness, then you can easily lower your standard. First, it starts with “God send me a godly Christian.” Then, we say, ” just send me someone that goes to church.” Then, we say, “God just send me someone who is nice.” Little by little we start lowering our standards. What’s even worse is that sometimes we may get distracted by random people who we feel like we have a connection with. There is nothing wrong with having a connection, but there is something wrong with having a connection and wanting to be with someone who is ungodly. We do this because we are tired of waiting and we want to switch our status from single to taken. Rushing into a relationship can easily lead to problems in the future. Fear of being single forever. Many people are struggling with anuptaphobia, which is the fear of being single. The fear of “dying alone” can cause people to get into bad relationships, remain in destructive relationships, etc. Stop criticizing yourself for being single. Be careful with spending too much time on social media, which can create bitterness, jealousy, and hurt. If you are struggling with this, you are not alone. I’ve watched many people who struggled with this issue get married. We must stop overthinking. Although we may not know what is going to happen tomorrow, we do know that God is in control of all situations. This biblical truth should give you so much encouragement. Take your focus off of what you don’t have and put it on what’s in front of you. When you’re so focused on being single that can easily lead to depression and bitterness. Focus on God and allow Him to work in your heart. Focusing on Christ and building your relationship with Him creates peace and joy in our hearts. Not only that, but it helps us with contentment. 29. “She focused on God. He did the same. God gave them each other. God is with you in your singleness. 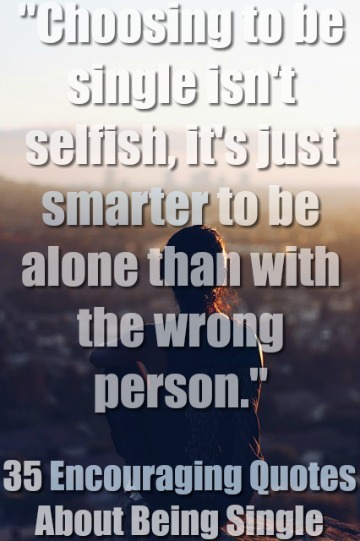 Just because you are single does not mean you have to feel alone. Once you get to understand God’s presence you will realize how close God is and how loved that you truly are by Him. He sees, He hears, He knows, and He wants to show you. He wants to fill that void, but you have to allow Him to. Get alone with Him daily and grow in your pursuit of knowing Him.